After successfully reducing expulsions in its K-12 schools, California is now moving to restrict the practice with even younger children — at the preschool level. To that end, Gov. Jerry Brown signed legislation last month that bars state-subsidized preschool programs from expelling kids unless an exhaustive process aimed at supporting the child and family is followed first. Children can be expelled from preschool as a result of any number of aggressive behaviors that could jeopardize the safety of other students, such as biting, kicking and shoving, or even for verbal classroom disruptions such as screaming. But the new law, Assembly Bill 752, authored by Assemblywoman Blanca Rubio (D-Baldwin Park), requires preschools to undertake a series of interventions and referrals before expelling a child. The law only applies to state-subsidized preschools. If the interventions — among them evaluating the child’s social emotional development and crafting a behavior plan — don’t resolve concerns, the preschool must help identify an alternative placement for the child. The law is part of a national drive that is underway to curtail the practice of pushing out students from preschools for disciplinary and behavioral reasons. It is motivated by evidence that preschool suspensions and expulsions can damage self-esteem, set students back academically, and increase the likelihood that they’ll face similar discipline and drop out in later grades. It is also a response to compelling federal data that shows that the preschool practices also disproportionately impact boys of color, particularly African-Americans, paralleling disproportionate expulsions in the K-12 grades. Yet unlike efforts in some states to target preschool expulsions, among them Connecticut and Ohio, California’s law provides no funding to help preschool programs better address the challenging behaviors of children who might otherwise have been expelled. That has raised concerns among some leading preschool educators. “A bill like this should be followed by resources,” said Beatriz Leyva-Cutler, director of BAHIA, Inc., a nonprofit organization in Berkeley that runs bilingual preschool and after-school programs. She recalls that years ago a now-defunct organization of therapists regularly visited her school, training teachers and working with children and families. Complicating the regulatory process is the difficulty in determining just how often preschool kids are dropped from the rolls for disciplinary reasons. According to an analysis issued this week by the Center for American Progress, as many as 17,000 preschoolers were expelled nationwide from private and public preschools last year and 50,000 suspended at least once last year. The data stems from responses from parents on the 2016 National Survey of Children’s Health conducted by the U.S. Census Bureau. This was notably the first representative survey that included both private and public preschools. But the most widely cited data, drawn from a nationwide survey of preschool teachers, is a dozen years old. In a 2005 report, Walter Gilliam, the director of Yale’s Edward Zigler Center in Child Development and Social Policy, came to the startling conclusion that the rate of preschool expulsion was triple that reported for K-12 students. Gilliam’s study also found that African-Americans were about twice as likely to be expelled as Latino and white preschoolers, and were over five times as likely to be expelled as Asian-American children. Data collected by federal civil rights officials beginning in 2011 show similar racial disparities. Many preschool disciplinary actions fall beneath the radar, Gilliam said. Since preschool is “voluntarily attended and voluntarily offered,” he said, the practice is often carried out informally, through subtle pressures on parents to withdraw their children, or a determination by administrators that the child is not a good fit for their program. “They sit down and say this place isn’t right for your child,” he said, noting that “soft expulsions” are also common. A preschool provider might ask a parent to pick up a disruptive child early, day after day, until the parent — who needs to work — has no choice but to find an alternate program that would work better for both the child and the family. The legislation signed by Gov. Brown is just one of several steps being taken in California to address the issue. Brault, for example, chairs a California working group that last year began drafting state policy and training recommendations for preschool discipline practices and data collection. She called the newly signed bill “a good start,” noting that it addresses expulsions only — not suspensions — and does not require the state to collect data that would capture the scope of the problem. Gilliam said California is following in the steps of about 20 states that have adopted policies or laws on the issue — most of them since 2014, when a federal law required states to develop such guidelines but set no deadline. California Department of Education spokesman Robert Oakes said national experts under contract to the department’s Early Education and Support Division will start meeting later this month to craft “best practices” that will ultimately inform state policy. If that fails, and the child’s participation continues to present a threat either to his or her safety, or those of other children, the Head Start program must work to find a more appropriate placement for the child. 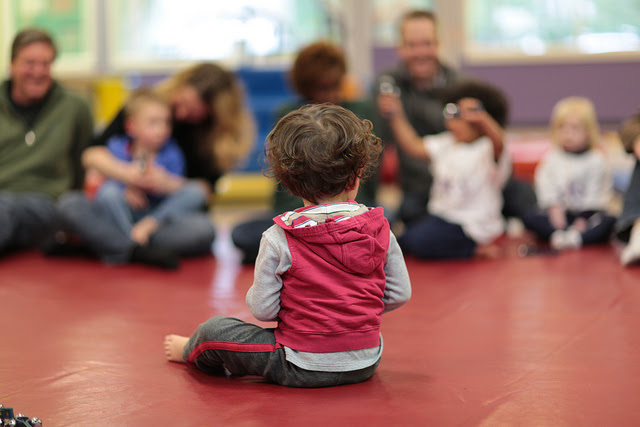 Kidango, a nonprofit organization that operates 50 childcare centers in the San Francisco Bay Area, sponsored the bill to reflect the Head Start guidelines, said Pepijn van Houwelingen, vice president of research and enrollment. The majority of Kidango’s students receive federal or state subsidies. Betty Robinson-Harris, who teaches preschool for the San Francisco Unified School District and has 45 years of experience in the field, said she had reservations about the bill when it was first introduced, but applauded amendments that require detailed interventions before a child is expelled. Robinson-Harris said she relies on close relationships with the child and family and a documented system of remedies that move from talking with the child to seeking outside treatment. “My belief is that young children’s behavior tells us what they need,” she said. “If a child this young exhibits a problem, there are some issues — neurological, social emotional, medical” that need to be addressed. “If the new law says you have to do A, B, C, D and E before a child is excused, I think that’s a good thing,” she said. I agree that this requirement to take a series of actions before expelling a child from preschool needs to be backed up by funding and lots of it! First, preschool teachers and assistants will need additional training to deal with the challenging behaviors as the child progresses through the mandated interventions. For the safety and educational needs of the other students in the class, there will probably need to be extra adults in the classroom. More psychologists will need to be available, and in many California communities those counseling the child will need to be bilingual. This law could be a real job creator! If the wages paid to preschools teachers and assistants are not increased, along with these increased responsibilities and stressors, there might not be enough applicants. For heaven’s sake give the preschools some resources for this! If a child is exhibiting the behaviors indicated here, this is likely a case of what early childhood author Dan Gartrell calls “strong needs mistaken behavior,” where the child is compelled by conditions beyond his or her control, and most likely beyond their family’s control. This is also a matter beyond the jurisdiction of the preschool program, and the program’s capacity to function adequately is strained by their work with this child and family. To do their job in providing child/family support, the preschool needs money for the demands on staffing, the availability of resources for the family (housing, medical care, social and psychological assistance, food, etc. ), and professional coaching for the staff. It takes a good deal of experience, study and training to be highly effective working with children and families who suffer from unemployment, abuse, domestic violence, homelessness, or chronic discrimination. It is those unregulated conditions which tend to be demonstrated by young children who not only display unregulated behavior, but who also lack the human conditions necessary to stabilize themselves in social relationships. Many families are eager to do the hard work necessary to manage themselves in disheartening circumstances if they can be helped effectively.